The United States Postal Service's "Postal Passport to the Galaxy" offers a journey through space history in stamps. The United States Postal Service is now offering a passport to visit space exploration history. The "Postal Passport to the Galaxy" promises its holder "a journey through space in stamps." The collectible booklet, which is also advertised as the "Sally Ride Folio," was first introduced by the U.S. Postal Service (USPS) on the same day it released a new postage stamp for the first American woman in space. 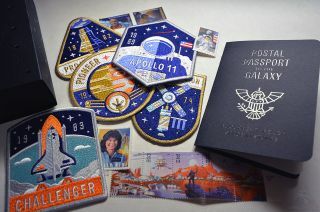 The folio, which is about the same size as a U.S. passport, comes packaged in a "keepsake box" that includes stamps and patches representing "significant space firsts." "Learn about historic 'firsts' and mount nine stamps in your passport," writes the USPS. The stamps include the new Sally Ride issue, the Mercury Project and MESSENGER Mission stamps from 2011, the set of five "Space Discovery" stamps released in 1998 and the 1994 First Moon Landing issue that commemorated 25 years since the Apollo 11 mission. Adhesive mounts are also included to attach the stamps to the passport's 28 pages. The folio features places to display the nine stamps and 13 more released in celebration of NASA's human and robotic missions dating back to 1961. "You can accept the challenge of collecting the rest of the stamps in the passport, affixing them to the mounts in the book," the USPS explains on the first page of the folio. The USPS "Postal Passport to the Galaxy" can be used to mount stamps for "space firsts," such as the first moon landing in 1969. Each of the pages provides a brief history of the milestone it celebrates. Some of the spaceflights featured include the first American spacewalk in 1965, the first U.S. mission to land a spacecraft on the surface of Mars in 1976, and the first spacecraft to reach Pluto in 2015. The five accompanying embroidered patches overlap with some of the space missions celebrated by the stamps. The emblems include Project Mercury; the first lunar landing by the Apollo 11 crew; the first U.S. space station, Skylab; the first mission to Jupiter, Pioneer (10); and the first American woman in space on the space shuttle Challenger. The patches, which vary in size from 3 to 3.5 inches (8 to 9 centimeters), are USPS original designs. Each is dated for the year a U.S. stamp for the same mission was issued. The "Postal Passport to the Galaxy" highlights many of the U.S. space stamps released over the last six decades, but is not a complete philatelic record of space-themed issues. Nearly 100 different USPS stamps have depicted rocketry, satellites and space exploration since 1948. See the five embroidered patches included in the USPS's new "Postal Passport to the Galaxy" at collectSPACE.